I did miss the walk because I was cooking but Chris and Becky got to walk a bit this afternoon with Keith in between eating French Toast (another tradition) for breakfast and a big turkey dinner. I just love that photo of Chesty all snuggled up!Glad you had a wonderful Christmas! Chesty looks like a baby in his bassinett! Do you cover him or does he manage to snuggle under his blankie like that himself? So cute! Merry Christmas Mary! Thanks for sharing your photos! Chesty is so sweet – love how he’s snuggled up. Hope Santa was good to him (and you)! 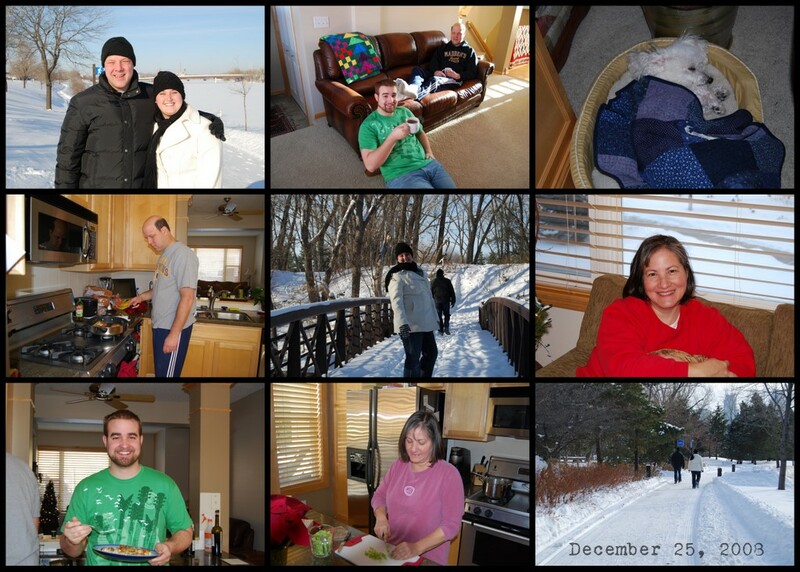 What a terrific photo collage…already sweet memories now.Merry (belated) Christmas to you and yours, Mary! And to continue the theme … love the pic of Chesty!It looks like everyone enjoyed themselves, and traditions carry on!